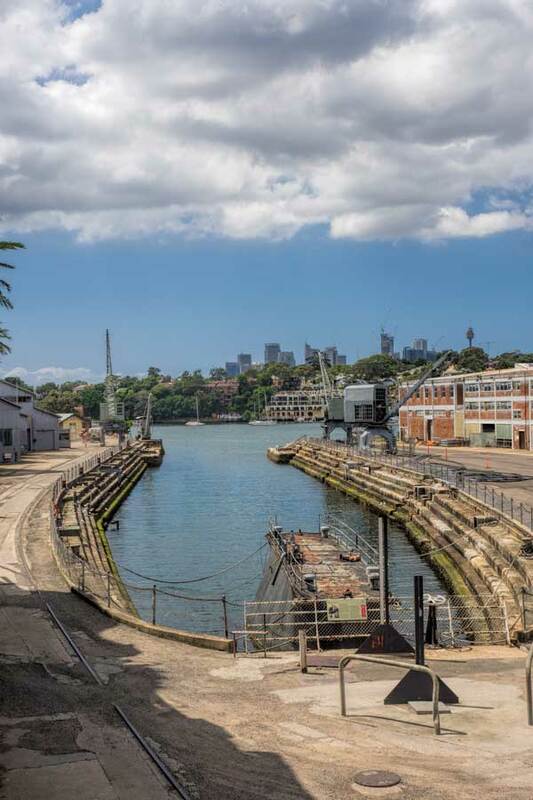 One of the more unusual places we visited while in Sydney recently was Cockatoo Island, a tiny island in the mouth of the Parramatta river. If you haven’t spent much time in the city you may not have even heard of this little 18 hectare patch of land so I thought I’d share a few reasons you might be interested to take a closer look. Unlike most of the islands in Sydney harbour, Cockatoo Island is on a major ferry route making it both simple and quick to access. It’s located a 10 minute ferry ride from Circular Quay on a direct trip or 20 minutes on those ferries that take the scenic route via Darling Harbour. The trip costs under $6 each way and the cruise over offers exceptional views of the city coastline and harbour bridge as it passes. We find the Sydney ferries a great way to see the city and use them frequently during our visits. If you’re interested in getting around Sydney on public transport you might want to check out the linked article which examines the savings and convenience of using an Opal Card even if you’re only in the city for a short time. Not far from the wharf when you arrive on the island is the information centre. You can pick up brochures for the self guided walking trails or learn a little about the layout and background of the island before heading off to explore. I will say up front that if you read this site regularly this is a very different sort of island to the ones you would normally find us visiting and sharing here. Usually our preference is uncrowded natural spaces where you’d find us hiking, relaxing on secluded beaches or photographing wildlife. 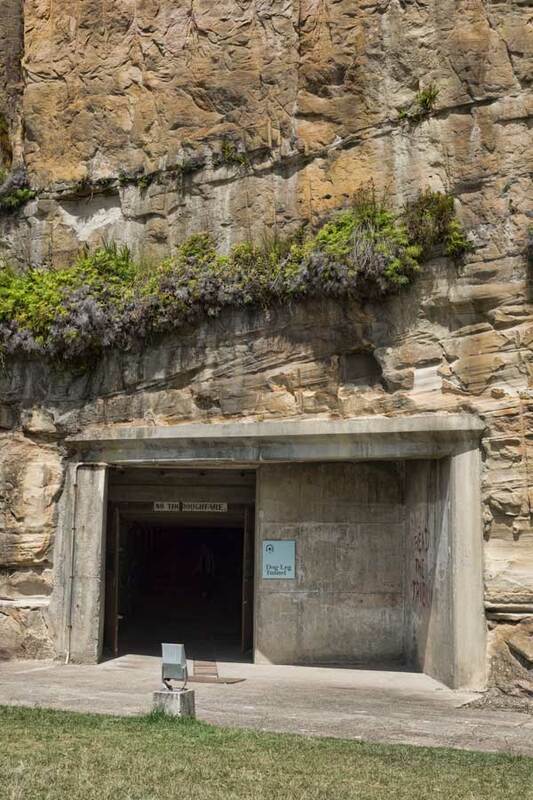 Cockatoo Island is quite the opposite, if it wasn’t for its sheer rock cliffs you could be forgiven for thinking it was fully man-made as it’s almost completely covered in concrete, structures and industrial equipment. There’s a reason for that though and it’s what makes the island interesting. The name Cockatoo Island may also be a little misleading. We didn’t see a single cockatoo (a noisy white Australian parrot) on the island but the name comes from the islands earliest history pre-European settlement. It’s known that Aboriginals in the area didn’t live on the island as it had no fresh water but it’s thought the local Wangal people did camp and fish here prior to the arrival of European settlers and perhaps even used trees from the island to make their fishing boats. Between 1839 and 1869 Cockatoo Island operated as a convict penal settlement. Looking at the remains today you can imagine that it must have made for a harsh living and working environment. 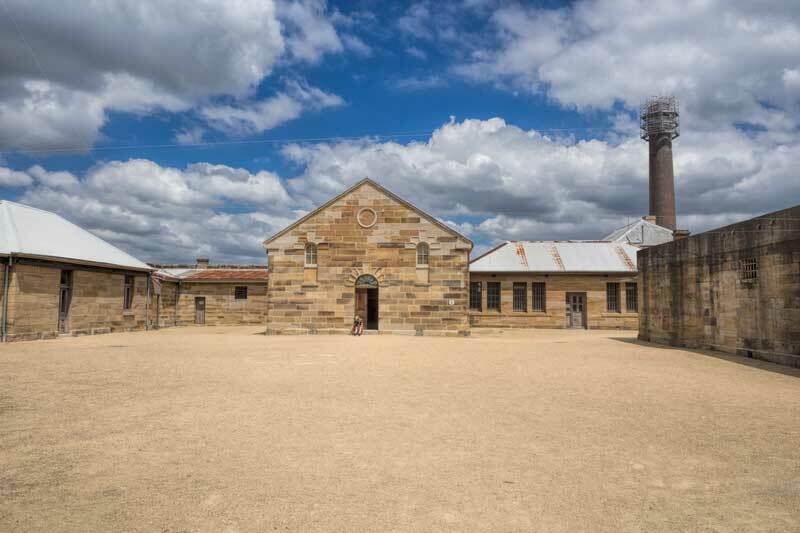 On the island are the remains of a number of the convict built structures including the prisoners’ hospital and barracks, a mess hall and underground silos. Overcrowding in the colonial penal settlement reached critical levels and at one time 500 prisoners were living in a space not much larger that a modern house with barely room to lie down. 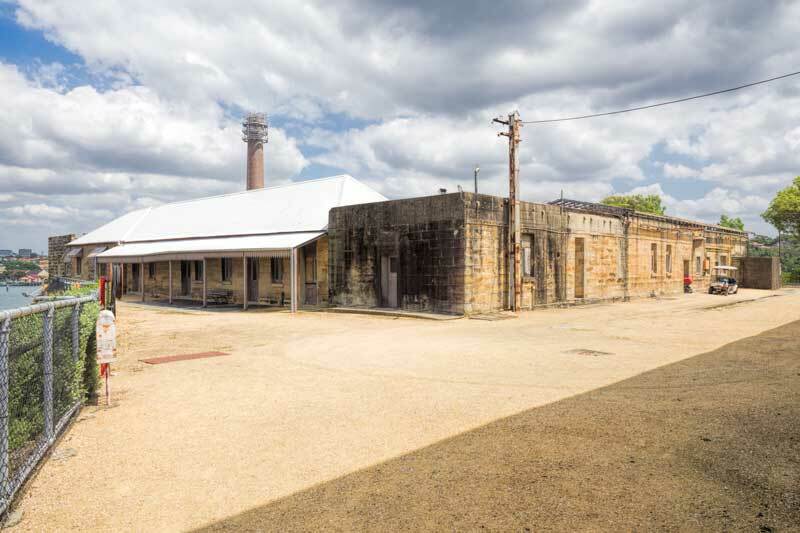 Cockatoo island is one of eleven convict heritage sites in Australia that are listed in the UNESCO World Heritage register as a a place of special cultural and/or physical significance. Despite having no interest in history what so ever during my school years I do love to find and include these sites on our travels. In 1871 the island became an industrial school for girls. In additional to being a reformatory for delinquents it was also home to orphans although the treatment and conditions for the two were not significantly different. In 1888 it was closed and the girls were moved to Parramatta. 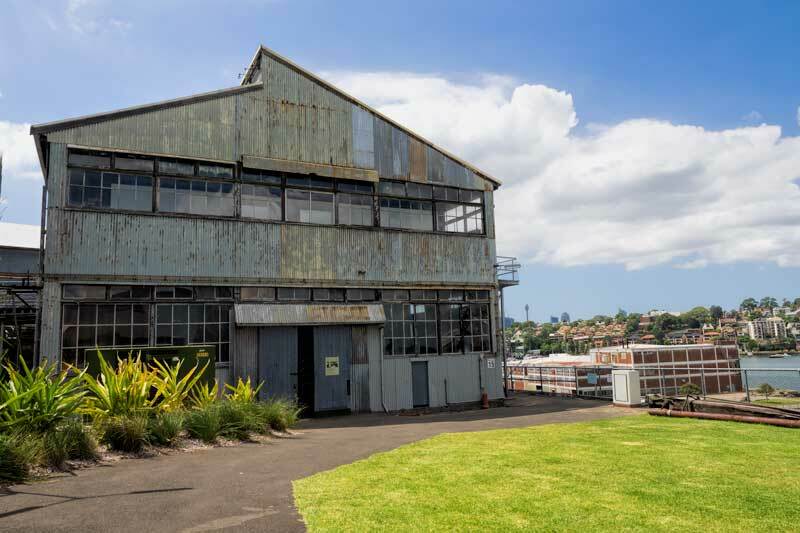 By the time of World War II Cockatoo Island had become the primary repair facility for ships in the Southwest Pacific. Around 250 ships were tended at the facility including the Queen Elizabeth and Queen Mary. The facilities were also used to convert merchant ships and passenger liners for the war effort. Ships damaged in wartime attacks made it back considerable distance to the island for repairs including the HMAS Australia after kamikaze attacks in the Philipines and the HMAS Hobart after torpedo attacks in the New Hebrides. 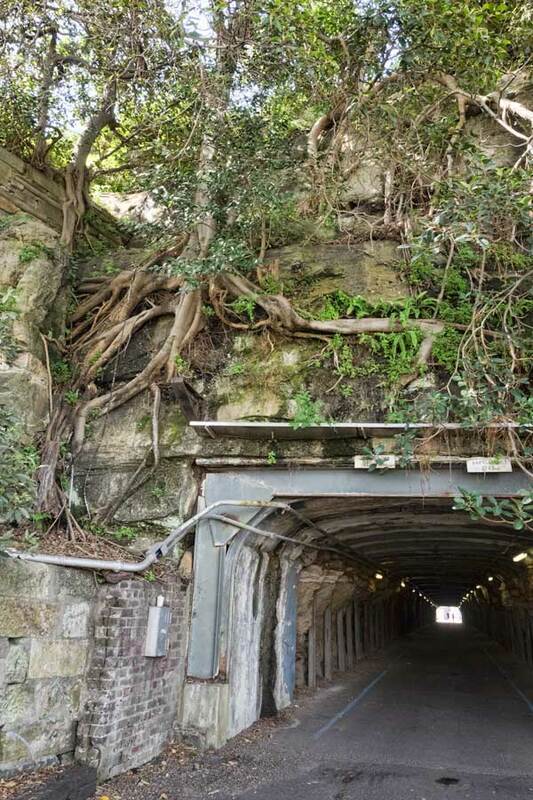 It’s importance to the war efforts raised concerns about the potential for an enemy attack on the island and extensive bomb shelters were established in the tunnels beneath the sandstone hill in the centre of the island. From 1857 until 1991 Cockatoo Island was Australia’s primary ship building and repair facility with the yard handling over 12,000 dockings. This history was a small part of our interest in visiting the island as Drew had spent some time on the HMAS Success while with the NZ Air Force. HMAS Success was the last and largest naval ship ever built and launched from the island before the controversial decision to build Australia ships overseas. There is an audio visual display about its build in an annex to the dog leg tunnel. Viewing the island as a heritage site I was surprised to see that some boat industry continues on the island today although much smaller in size and scale. Dry berthing, mooring and a full range of maintenance services for boats are still run commercially from the site. The climb to the top of the hill is either via a road or very steep stairs straight up the cliff at the back of the island. The harbour and cityside views alone are worth the climb. Near the top of the stairs, this building is a rare example of a full size Mould Loft built in 1911. Full scale templates of the steel portion of the ships hull were drawn out and cut here. Everything was marked out in increasing levels of detail on the floor of the building and the marks can still be seen in parts today. Although a huge space only half the ship could be templated at a time so naval cadets spent a good portion of their working week hunched and crouching. Later in 1970 when technology allowed 1/10 scale templates to be converted and used the work continued on the upper level. Other remnants of the time are the Sutherland dock built between 1882 and 1890 where larger ships and liners could be dry docked. The second photo is of beam benders a relic of the huge scale machinery used in the ship building industry. There are three tunnels cut through the sandstone cliffs on the island. The first was carved through in 1912 during the construction of the navy missile destroyer HMAS Brisbane. It runs in a straight line from the southern docks to the shipyard. 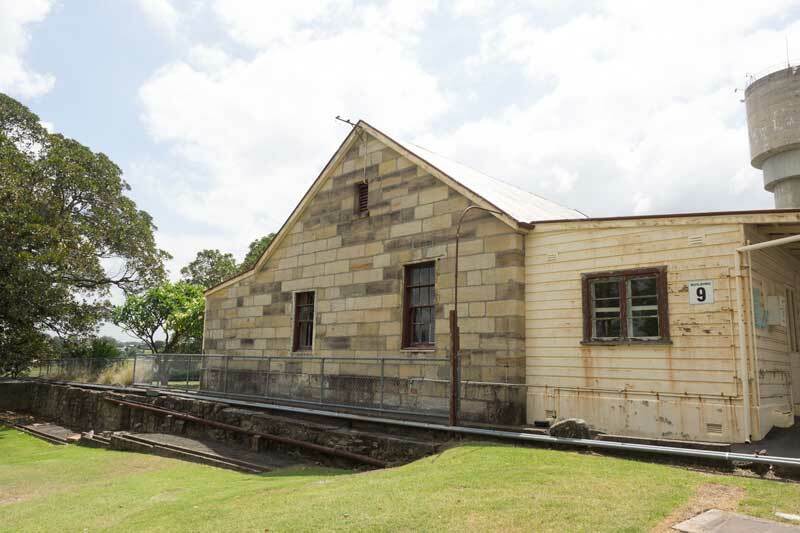 At 113.3 metres long with its roof reinforced with tram rails it was also used during WWII as an air raid shelter. The dog leg tunnel entrance is near the information centre. At 180 metres long it was created in 1915 to move workers and materials more efficiently around the island. This also served as an air raid shelter during the war and the various annexes served as storage and even an infirmary during that time. There are several alternatives for accommodation on the island if an offshore stay is part of your Sydney wish list. One of the more unique is to stay in one of the permanent tents in the camping ground right on the harbour edge. It’s not a budget option but would be a memorable stay and the fire pit looked like a very inviting meeting place for swapping travel stories. And finally you can’t leave the island without enjoying the million dollar views while you relax with a coffee, meal or glass or wine. The sparkling waters and Sydney’s harbour bridge from the outdoor cafe style seating at Societe Overboard are something not to be missed on your visit and I highly recommend their chocolate chai. If self catering is more your thing there is also no shortage of picnic areas where you can enjoy similarly stunning outlooks if you prefer to bring along your own drinks and snacks. 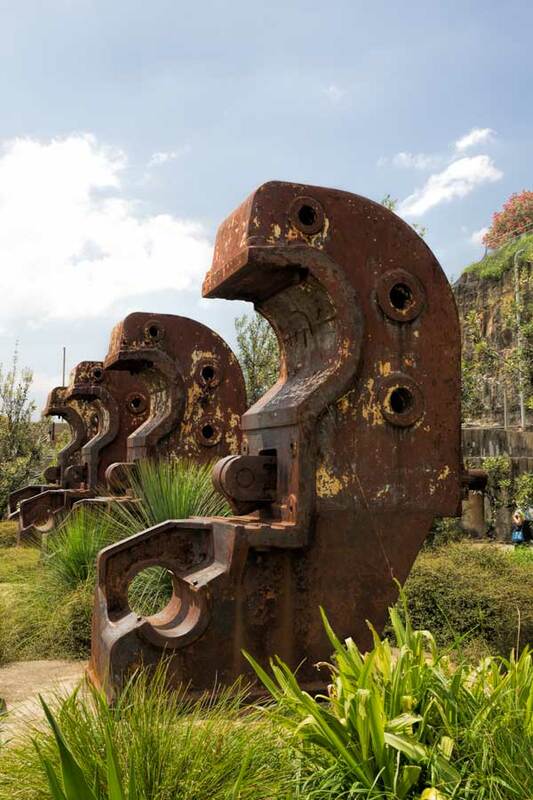 Have you visited Cockatoo Island in Sydney? Do you enjoy learning about the history and cultural background of places in your travels or does that bring back all too vivid memories of high school history lessons? David and I stayed overnight there a few years ago – not in a tent but in one of the cottages. It was just fabulous after all the day visitors went home. We felt like we had the whole island to ourselves. I was hoping that you guys saw a cockatoo. I should have known it was all in the naming 🙂 Interesting history there and it looks like a really interesting place that I had never even heard of. It was OK Nataha, cockatoo are really common, we saw others that day in the city parks and we get them in the garden all the time, just not on the island. I’ve never been to Australia but the more I read about it, the more I want to go. Sydney would be high on the list of this to see and now Cockatoo Island :). Beautiful photos BTW. Talk about taking history out of the classroom, definitely interested after reading this! Will make sure to stay on the campsite to complete the trip, thanks for the tips! I wish I’d known about Cockatoo Island when I was in Sydney two years ago. I spent about five days in the city and I’d have loved to visit because it seems to be an interesting place and very different from Sydney. I lived in Sydney for years and never visited Cockatoo Island. I finally made it to Cockatoo last year and loved it! I stayed in one of the houses up on the hill. There was a big storm and lots of creaking noises. I’m sure it was haunted. 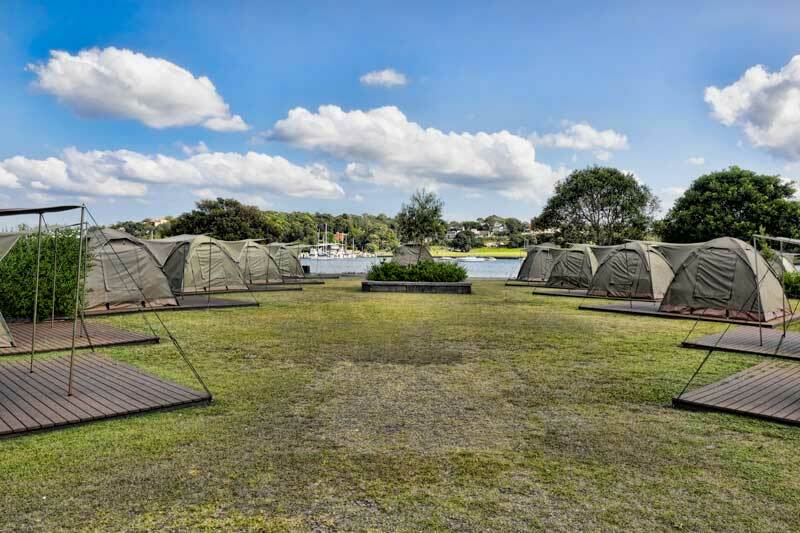 Cockatoo Island is a lovely spot to go camping in the middle of the harbour. History is always more impactful when you can experience it outside the classroom. It gives a context that’s grounding for all the information you learn along the way. Cockatoo Island looks very interesting and I always love to glimpse WW2 history from a non-U.S. perspective. Thanks for sharing about this heritage site! So much history in the place! I love going to such heritage places. The very mention of tunnels of 1912 excited me. The camping idea too seems good and doable. Cockatoo sounds like the perfect destination for history buffs! Would love to go there in the future. And the photos are so gorgeous! We loved camping on Cockatoo island, we took our own gear and stayed for two nights, the views of the harbour were amazing! Hi Kerrie. Thanks, that’s good to know, it did look like fun with those incredible views and I think it would be great to be there after most of the visitors have left for the day.